Tuxedo? Formal three-piece? Suit separates? Whatever vibe your partner is going for on your wedding day, get inspired by these real grooms' trendy styles available from Generation Tux + The Dessy Group. 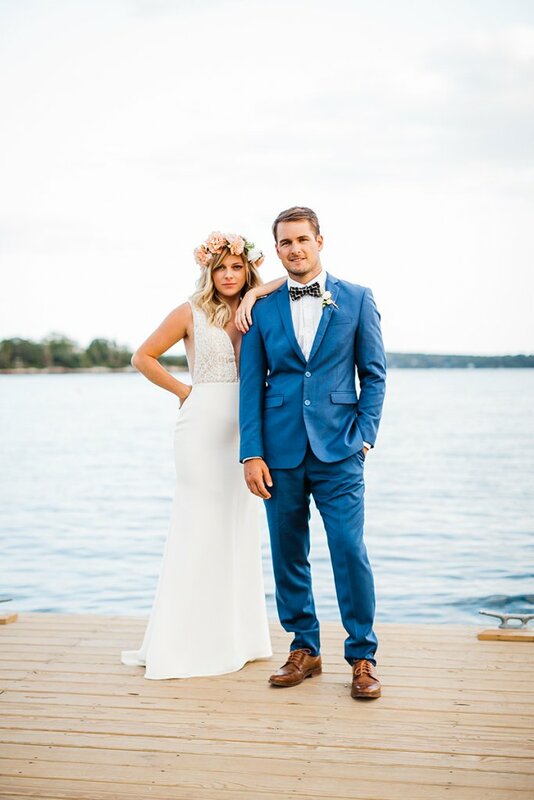 Cool blue tones were on-theme at Payson and Christopher's wedding celebration, from the groom's bright suit to the calm waters where they said, "I do". At their wedding on an idyllic harbor in Maine, Payson and Christopher dressed their groomsmen in a color that was incredibly fitting for the nautical setting. Fun little details can have a big effect on your wedding party's attire. Christopher's groomsmen were able to bring a bit of their own style to their looks with patterned bow ties that offset his black-and-white design. We are loving the simple elegance of this dapper couple. The groom's classic black tux and the bride's flowy A-line gown create an understated yet glamorous look that's picture-perfect for any wedding day. Just call him "Bond" - there's nothing more dashing than a black tuxedo, and this design from Generation Tux will give your groom a debonair look that works from day to night. While this groom's look is perfect for a black-tie wedding, you'll both be all smiles no matter where you're tying the knot. If you're like Erika and Z and plan to get married somewhere warm, a tan suit is perfect for the occasion. The light color reflects sun rays rather than absorbing them, so the only thing your groom will have to sweat about is remembering his vows. This suit is crafted with Merino wool so that it feels light and breathable throughout the day. While the khaki color looks great in sunlit photos, the streamlined fit and formal three-piece design make it a perfect day-to-night style. Gift your wedding party with accessories that they can use on the big day and beyond! Sunglasses can be a fun, fashionable addition to your groomsmen's ensembles, and keep them from getting squinty-eyed during the photo session. At Chris and Katherine's wedding on a ranch in Arizona, the groom's blue-toned suit turned up the heat as much as the hot desert sun. A navy shade like this juxtaposes wonderfully against a sandstone backdrop and makes for a great visual. Chris and his groomsmen paired their navy three-piece Generation Tux suits with boutonnieres that featured desert flowers, an homage to the wedding day's gorgeous locale. A larger-than-life cactus was the perfect symbol for Chris and Katherine's big day, surrounded by their loved ones and the natural beauty of the Arizona desert. At Matt and Carrie's lakeside wedding in Maine, the groom's look was inspired by other elements of the day. His blush-colored tie was chosen to match with Carrie's rosy bouquet. On his wedding day, Matt had all of his best friends by his side. While his four-legged pal got away with going au naturel, his groomsmen suited up in gray three-piece styles paired with bow ties. Mix up your wedding party's ensembles with accessories that make a statement. We love that Matt's groomsmen donned peach bow ties for the occasion, which complement the groom's light pink, traditional style. A pop of color adds a nice touch to your groom's attire - this wedding party paired dark blue suits with red ties for a fun and stylish twist. Give your groomsmen some flair, even if it's under the surface! Your wedding party can still look prim and proper, but adding a fun accessory like funky socks serves as a reminder that everyone's there to have a good time. Matching the groomsmen's accessories to your wedding decor is a great way to get a cohesive look - here, the wedding party's ties go perfectly with the deep red roses in the bridal bouquet and floral arrangements. For their stunning engagement photoshoot in Antelope Canyon, this couple went with a more casual look that didn't minimize their incredible backdrop. This groom-to-be paired suit separates from Generation Tux for an easy, clean-cut look - the navy jacket and tan pants create an ensemble that's simple yet trendy. A pair of suspenders pull everything together, taking this menswear look from office-casual to classically dashing in a second. Ashley and Adam hosted their wedding on a sprawling farm, but didn't let the laid-back atmosphere stop them for dressing up for the occasion. This groom's formal three-piece suit from Generation Tux pairs perfectly with the intricate neckline and bodice of the bride's gown. Adam's three-piece suit added a touch of refinement to the wedding's rural setting, and the light gray tone is excellent for a summer afternoon ceremony. Adam and his groomsmen wore ties in the same shade of mint as Ashley's bridesmaids' dresses, creating a streamlined look across their entire wedding party. If you think you'll be flying high on your wedding day, imagine getting married 400 feet above the ground! Kim and Ryan eloped in the Moab Desert, and exchanged vows in a daring, intimate ceremony while suspended on a skynet. Ryan's patterned suit stood out against the gorgeous red canyons that surrounded the couple on their big day. Whether you're hosting a black-tie wedding, laid-back nuptials, or making mile-high memories with your close-knit circle, you'll find everything you need to dress your groom in style at Generation Tux + The Dessy Group. Browse more looks at Dessy.com!